The simple heart outline with its pre-printed text is surrounded by more hearts and roses. The sheet of paper measures 28 cm x 21.5 cm (11” x 8.5”). It's in fairly good shape, but has yellowed a bit and has a couple of small tears at the top and bottom. 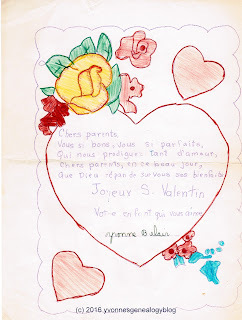 This Valentine is one of only two Valentines that I still have from my school days. The first one can be seen at Treasure Chest Thursday: Petit Valentin.